Twenty-seven (27) church workers and lay members of the Romblon-Mindoro Ecumenical Council (ROMINEC) along with the Mangyan leaders drew up action plans concerning the worsening environmental situation in Romblon and Mindoro during a seminar-workshop on Climate Change Adaptation. “When we talk about disaster preparedness, it is important to understand and appreciate the environmental context and issues that we are working on. And from there, realize their capacities to change or influence the situation. 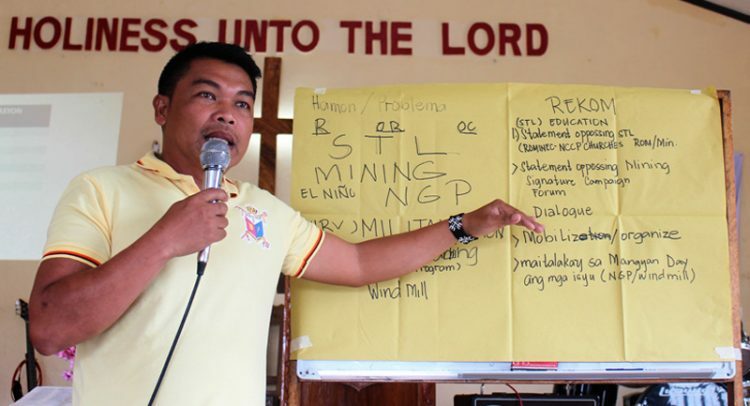 This activity offers space for the church people and community leaders to reflect on what they could do as an ecumenical community,” Mr. Edward Santos, the NCCP Education and Training Officer for Disaster Risk Reduction and Management (DRRM) said. Facilitated by the NCCP and supported by Act for Peace, in partnership with the Center for Environmental Concerns (CEC), the seminar-workshop was held at the The Salvation Army Nasucob Corps in Bulalacao, Oriental Mindoro last March 23, 2018. 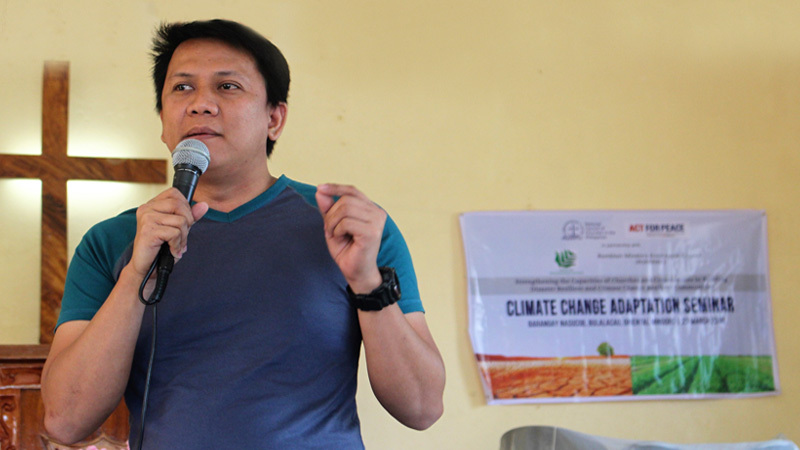 Mr. Ryan Damaso, Education and Training Officer of CEC, presented the crisis on climate change in relation with the Philippine environment context. “Our country, although rich in resources, suffers an environmental crisis as a reflection of a system in crisis. 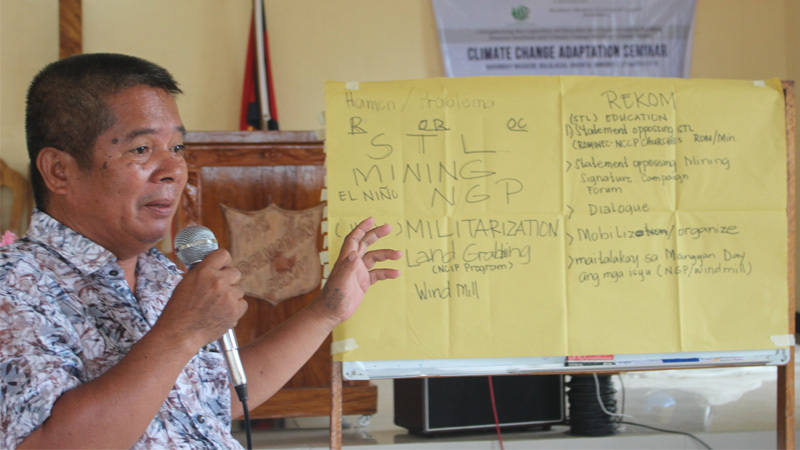 This reflects in the worsening poverty incidences, rapid deforestation, mining liberalization, biodiveristy loss, and threats to environment defenders and advocates, among others,” Damaso highlighted in his presentation. According to the Philippine Statistics Authority, the national poverty incidence accounts up to 21.6% in 2015. Moreover, 5 of the 9 basic sectors consisting of farmers, firsherfolks, children, self-employed and unpaid family workers, and women, belonging to poor families, had higher poverty incidence than the general population. “This vulnerable position of the Filipinos living in poverty, compounded with issues of rising environmental plunder and destruction, is aggravated further by the effects of global warming and extreme weather conditions induced by climate change,” Damaso clarified. Inherent to the Mangyan’s identity is being a defender of the environment which they consider as their ancestral domain – even at the cost of their lives. According to HAGGIBAT Mangyan Mindoro, the organization of Mangyan tribes, human rights violations and aerial bombings in Mangyan communities have been recorded since last year. 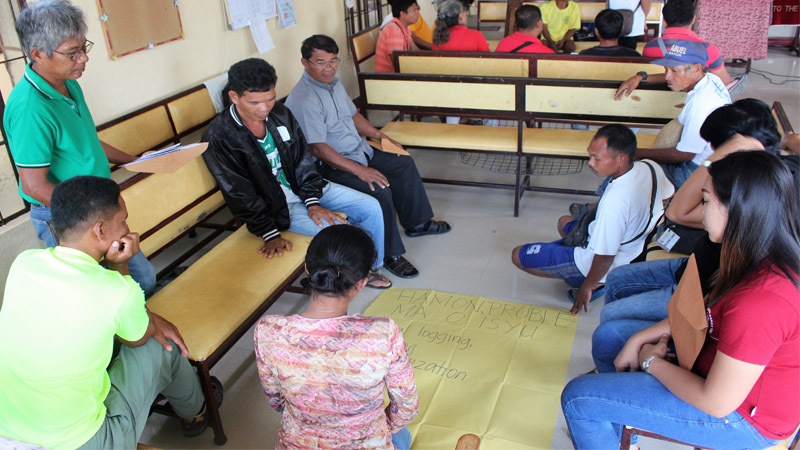 “Threats and human rights violations against environmental defenders are being done to inflict fear and silence the community, especially those who are vocal against environmentally destructive activities such as development aggression,” shared Ptr. Tantin Tugas, a Mangyan church leader of the Convention of Philippine Baptist Churches (CPBC). At the end of the workshop, the participants identified specific environmental issues that affects their communities’ capacity to be resilient to disasters. The participants included educational activities, information campaigns, and lobbying as part of their action plan with the aim of raising awareness on the environmental issues to the broader public, and amplifying their calls to the government authorities.